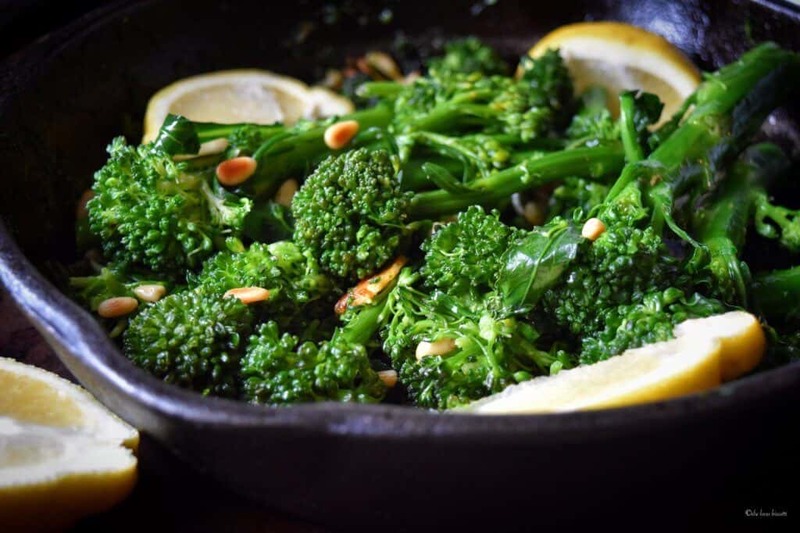 This vegan and gluten free recipe for Easy Garlicky Sauteed Broccolini is a simple, no fuss side dish that is also healthy and delicious. 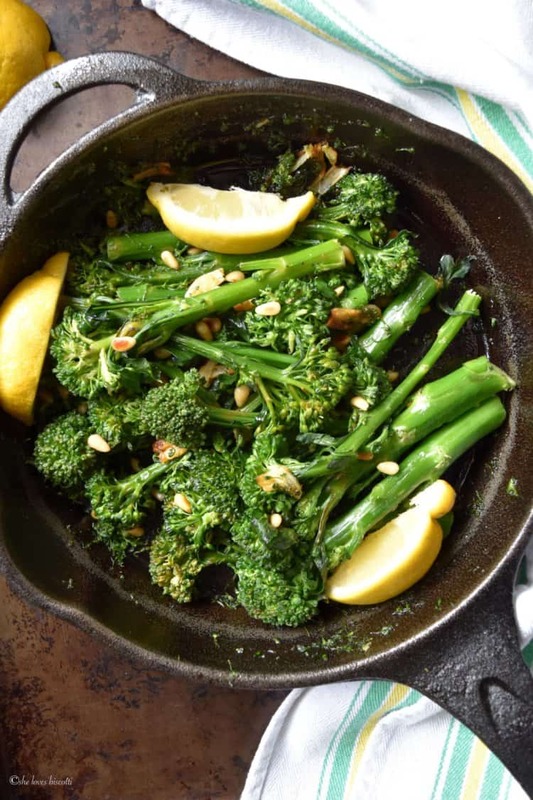 This broccolini recipe is the best way to cook this vegetable in less than fifteen minutes. It all begins by trimming the bottom third of the ends of this beautiful vegetable. When buying broccolini, look for stalks which are bright green, and make sure the bulbs are tightly closed. If you have stalks which are slightly thicker, cut them in half or even in quarters (if really thick). Unlike broccoli, there is no need to peel the stalk. Just give them a quick rinse and they are ready for the next step. Bring a large pot of salted water to a rolling boil. Add the broccolini and once the water returns to a boil, cook for about 2 minutes or until tender but still crispy. Drain and set aside. Over medium heat, drizzle about 2 tablespoons of olive oil in a pan. Once the oil is hot, add the slivered garlic and saute for about a minute or so. If using, add red chili flakes, and saute for another minute. Finally, add the broccolini and saute for another 2-3 minutes. Season with salt and pepper and you are done! 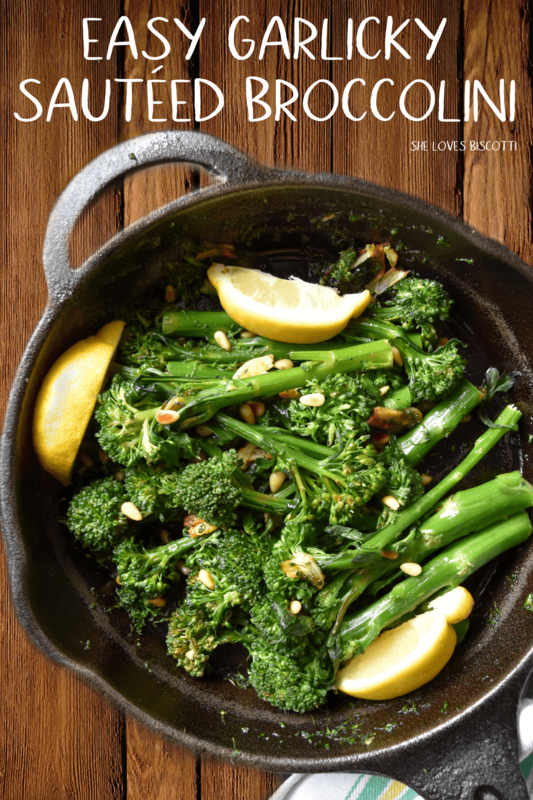 If you like, just before serving, you can sprinkle some roasted pine nuts (or almond slivers) and squeeze a little lemon juice over your broccolini. 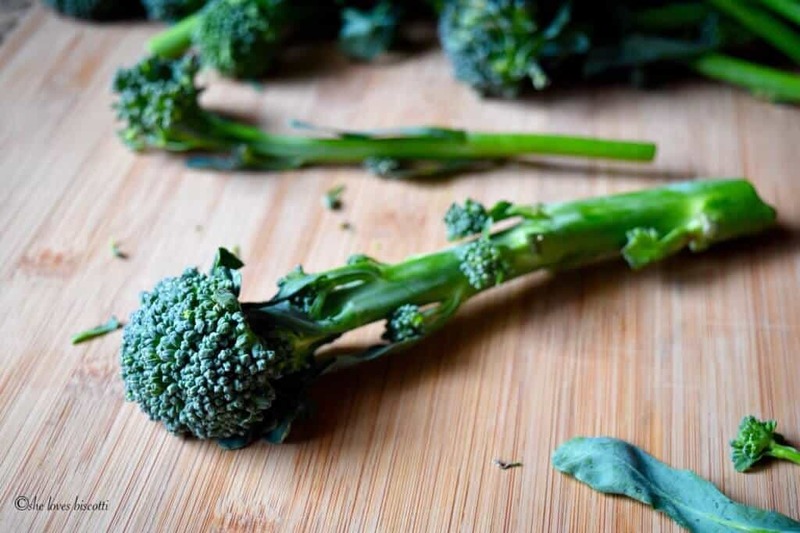 Did you know that broccolini, also known as broccolette, is a cross between broccoli and Chinese kale? This hybrid vegetable was actually created in early 90’s. It tastes a little sweet and so when paired with lemon juice and garlic, there is a whole lot of flavor sensation. As far as the nutrition is concerned, it is an excellent source of Vitamin A and C, and numerous other antioxidants and phytochemicals. Definitely a good guy. Vegetables – love ’em or hate ’em, there is no denying that they are good for you. There never seemed to be a shortage of green vegetables when I was younger. Whether is was Italian Style Garlicky Broccoli Rabe or Sauteed Garlic Swiss Chard, vegetables were always the star. Looking back, it seems to me that my mom’s favorite way to prepare vegetables was a quick boil, followed by a quick stir fry. 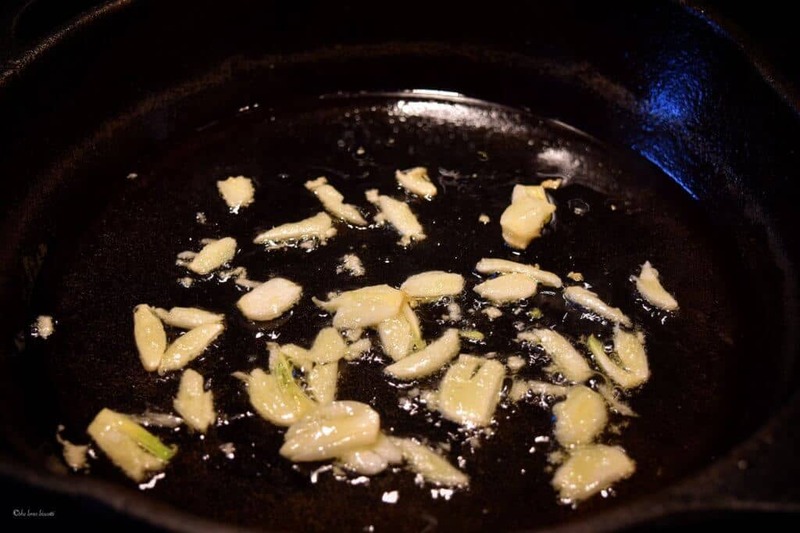 Of course, garlic was the common denominator – you can never go wrong with a little bit of garlic! 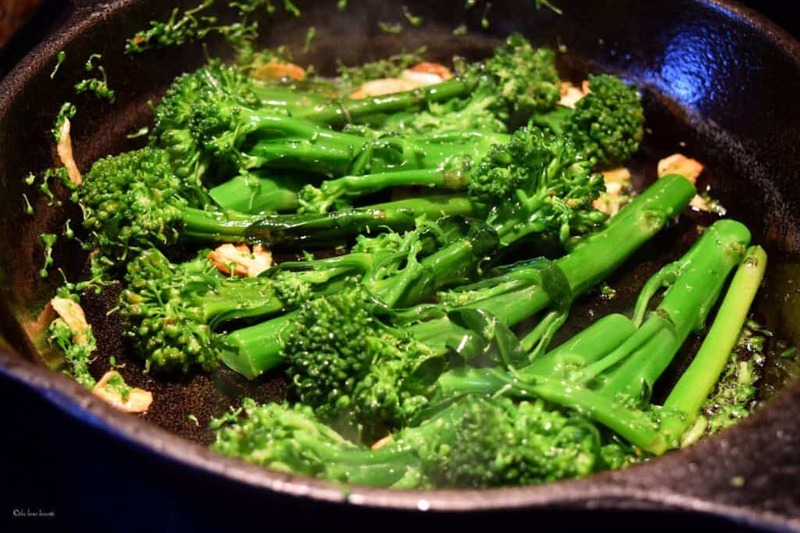 This recipe for Easy Garlicky Sauteed Broccolini was inspired by my mom’s boil & stir fry with garlic method for preparing veggies. It is always a hit at my home – and it always feels so nostalgic, too! So the next time you bump into these greens in the produce section and are looking for a quick and tasty side dish, you have to try these Easy Garlicky Sauteed Brocccolini. Enjoy! 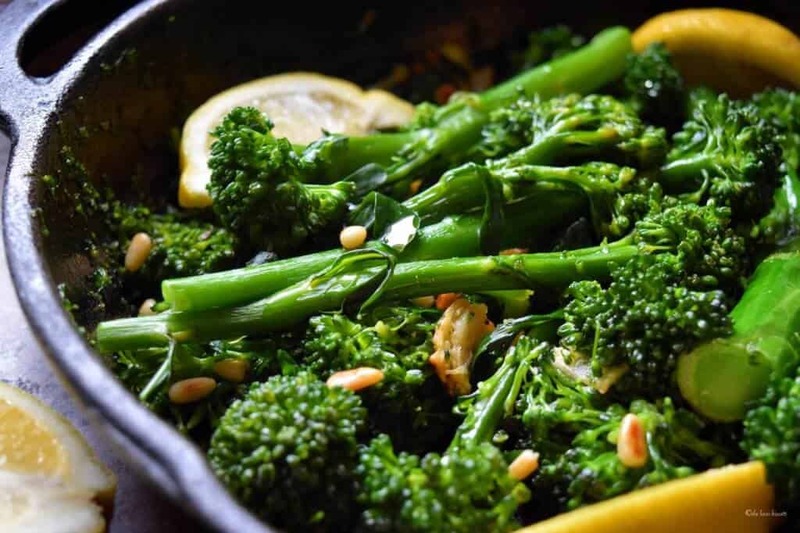 This vegan and gluten free recipe for Easy Garlicky Sauteed Broccolini is a simple, no fuss side dish that is also healthy and delicious. 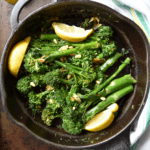 Come and take a look at the best way to cook broccolini in less than fifteen minutes. Trim the ends of the broccolini. Cook broccolini in a large pot of salted boiling water until tender (calculate about 2-3 minutes after the water returns to a boil). Transfer to a colander and drain. Set aside. Sauté garlic and chili flakes for 1 to 2 minutes. Add the broccolini and saute for 2-3 minutes or until tender. Sprinkle with pine nuts or almond slivers (if using). Place on serving dish and drizzle freshly squeezed lemon juice. You can find 1.5 pound bags of organic broccolini at Costco (Earthbound Farm). LOVE THIS POST? PIN IT TO YOUR SIDES AND VEGETABLE BOARD! I adore broccolini and rapini and make it this very same way! It’s so crisp and fresh as a side-dish. Looks and sounds delicious and such a gorgeous bright green colour! Love the lots of garlic and chili! This was always the family go to preparation for green vegetables, minus the pine nuts which I am certain add something special. Often the simplest preparations are the absolute best! Oh Maria, broccoletti (that’s how my family and I in Italy we call them) are possibly my favorite green, together with cicoria! And that is exactly how we make them as a side dish (or to add to pasta, or pizza 😉 ). Simple and oh so flavorful! Beautiful!